Each Ardell Little Black Dress Kit (ROMANTIC EVENING LASHES) contains 2 PAIRS of accent lashes (one natural, one glitter), one tube of lash adhesive, and one pair of tweezers. I had a little mishap with an eyelash curler & pulled almost all of my eyelashes out on the right side. My eyes are my best facial feature. So I thought hmmm....got to come up with a fix & false eyelashes was it. 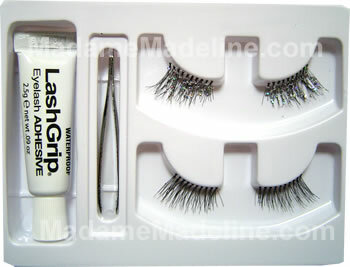 My lashes have grown back but I love the way I look with the false ones-so I am addicted & wear them everyday. Some of my girlfriends are even trying them out! It is truly amazing how something that small can change your look from very pretty to GORGEOUS!! Thanks!! I could go on and on about them!! z.Looking for more HALF False Eyelashes?